Cupcakes 'n Daisies: Vacation - Seattle Leg . . . . .
"Cooper, you're not allowed at the kitchen table, get down!!" We could not have had a clearer day to see the city from the top of the Space Needle. Cool Art at the baseball stadium...notice the sweater..the weather was such a welcome relief! Mr. Cupcake and I took a ferry from Seattle to Bainbridge Island, just to get to ride a ferry, our first. Esther's Fabrics ....the oldest fabric shop in the state of Washington! It was a total surprise. A very cute store with friendly and helpful sales folks. It's by In The Beginning fabrics. A small independent fabric company in Seattle, Washington. What a find! I have no plans for the fabric, but you know me and reds, it won't be on my shelf long. This was our first visit to Seattle and it won't be our last! And YES I did find a cupcakery, reviews to come in a future post....did I learn my lesson and eat the cupcakes in the store or risk it and get them to go.....come back and read all about it! Now I know what you look like! Thanks for the pics the quilt shop looks like fun! OMG Cooper absolutely looks like he's saying "Who me?" 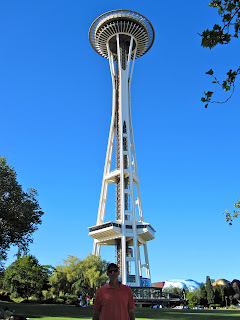 What great Seattle pictures....I've been there several times and never seen the sky so blue and clear. BEAUTIFUL! Your sweater and jacket have me dreaming of a trip to Seattle. It's so hot! Cooper is just adorable. Look how nicely he was sitting in the chair! Oh, I love that Cooper and his antics! Thank you for sharing your trip to Seattle - beautiful blue skies. Don't you love Seattle?! Thanks for sharing your little vacation and shopping adventures!!! I love In the Beginning fabrics! And the only local place to buy fabric seems to be getting rid of it! It was all 70% off recently! Its 96 degrees here plus a heat index. I can't imagine needing a jacket! Enjoy your trip and your new red fabric! If you loved Esthers you would have adored Church Mouse tea and yarns . . . come back soon! I always smile when I pull up your page...it is so happy! Thanks for sharing your vacation with all of us! Thanks for sharing some pictures of yourself, it's nice to finally see what you look like. I had developed a mental image in my mind of what you looked like just based on what I've read about you and lets just say I was way off. How nice for you that it was such a beautiful day when you went to the Space Needle, more often than not, that's not the case. I lived in Washington for 30 years, about an hour north of Seattle. I miss the weather, but not my husband because he worked outside a lot and the rain gets old then. I'm glad you had a good time visiting Seattle - I love seeing pictures of you! Glad you enjoyed your trip to Seattle. The mention of Bainbridge Island has me missing my oldest son...he lives close ;-) Thanks for sharing photos of yourself. I'm enjoying the cupcake reviews too.